Cannes, Day 4. When I arrived on Tuesday, full of hopes, I had no idea of what was expecting me on the Croisette. All of my friends asked me if I was going to climb the red carpet and see Leonardo, to which I had no answer. I was picturing myself like Alice in Wonderland, going down the rabbit hole and eating/drinking, this & that. In fact, it feels more like Asterix and Obelix in “the place that makes you mad”, trying to find the “A38 permit” in an aquarium full of sharks. I asked the first staff person I met where I should queue to get in the right screening and I would say to my excuse that “this is my first time here” and that “I’m lost”. To this he answered: “Sorry, I’m lost myself”. Very helpful. After two wrong queues, I ended up in the right cinema and even got in, despite all the bad looks that my yellow -untouchable style- press badge always attracts. There are the elected, the chosen ones, and you (me). I got used to it after a while. It seems like everyone is playing a role and in the end I’m not sure I can distinguish who is who. Some people make it. I am not going to. Even if you try hard, you can’t pretend to be someone else. I’m the one who could not steal in the supermarket when I was young because my face would get lobster-red. I won’t be the one trying to crash parties and red carpets with my canary badge, because they would notice it at first sight. Is it bad? No. I’m not dying to have free drinks. Some will say that this is stupid and that I’m not getting the whole Cannes experience. I’m happy watching films. So, tonight I went to a birthday-cocktail I was invited to. 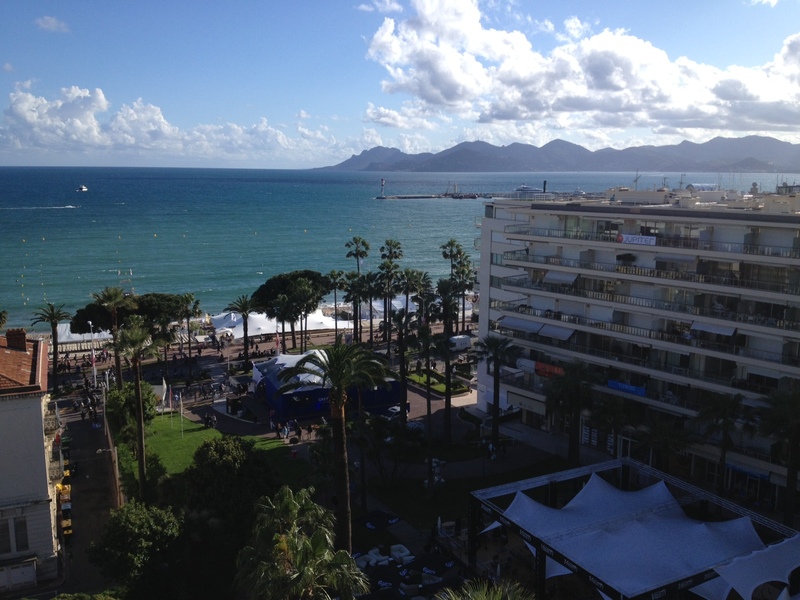 It was funny to have a glimpse of Cannes. Luxurious hotel complex, great view, great food, etc. When I went, reassured that “my” Cannes was going a promising way, I took the wrong elevator and ended up in the house-keeping elevator in the basement floor. Back to reality, girl!